Early in Church history lay people proclaimed God’s Word in the liturgical assemblies. Gradually, though, this responsibility became one of the minor orders conferred on men in training for ordination. As Vatican II challenged all of us to reassess our baptismal role, the role of Lector and reading sacred Scriptural passages in Church services once again became open to lay people. Reading is therefore one way in which we can publicly witness to our faith, in answer to our baptismal call. 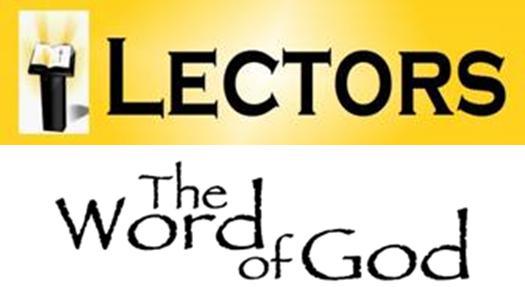 If Lector reading is to be a Ministry, a “witness to faith” for a person, then the reading has to be much more than just a good sight reading and articulation of words. As a Ministry and Lector, our reading is to be a true proclamation. The Bible is God’s Word, and Jesus is the Word made Flesh. Just as Mary gave flesh to the Infant Christ, so too do Lectors give flesh to the Word Who is Christ. We are His mouthpieces. Christ is present, of course, regardless of our style as Lector, but the reality of His presence is strengthened and increased when His Lector proclaims with faith, skill and compassion. Lectoring then, in this way, is not just helping out at church on Sunday. Lectoring is to be truly proclaiming the Word, effecting the presence of Christ within the worshipping assembly, and finally, to enabling a consciousness of how God’s Word is calling each of us to His service and to serving God’s people. If you are interested in learning more about this ministry, please contact Brenda Callahan at (305) 294 1018 or email bcallahan@stmarykeywest.com.